Return Is Part Of The Lorell Chateau Series That Offers Contemporary Laminate Office Furniture With A Durable Design And Multiple Configuration Options. Top Features Reeded Edge Detail For A Distinct Look. Design Also Includes A Full Modesty Panel For Privacy And High-Quality, Walnut Laminate Surface For Durability. One Grommet Hole In The Top Allows Easy Cord Routing. Connect This Return To Chateau Desks And Credenzas To Create The Office That Works Best For You. Add Lorell Essentials Series Pedestals (Sold Separately) To Expand Your Storage Options..
Return Is Part Of The Lorell Chateau Series That Offers Contemporary Laminate Office Furniture With A Durable Design And Multiple Configuration Options. Top Features Reeded Edge Detail For A Distinct Look. Design Also Includes A Full Modesty Panel For Privacy And High-Quality, Walnut Laminate Surface For Durability. One Grommet Hole In The Top Allows Easy Cord Routing. 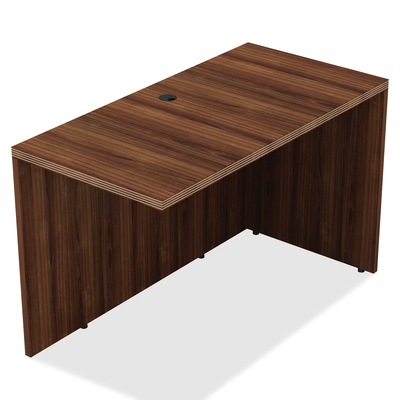 Connect This Return To Chateau Desks And Credenzas To Create The Office That Works Best For You. Add Lorell Essentials Series Pedestals (Sold Separately) To Expand Your Storage Options.